Louella Odie is a small brand founded by a mother-daughter team Karen and Lauren Mead. They’re originally from the Isle of Wight and now live on Lamma Island, a twenty minute ferry ride away from downtown Hong Kong. I was surprised to learn that life on the island is rather rural, quite tropical and is beach based. Not what one imagines when thinking of Hong Kong. Karen is a print maker and artist by profession so they use her sketches and prints and apply them to their products. Her distinctive style has always reflected her surroundings. Lauren, her daughter has a background which includes fashion branding and business start-ups. In 2013 they crafted a range of handbags and silk accessories and their brand was born. Louella Odie designs are taken from original artworks inspired by their experiences of living in different countries, and particularly by the ocean with which they both have a strong affinity. I couldn’t resist adding this stunning photograph of Lauren swimming with Manta Rays which I saw on her Instagram feed. Since seeing them in their natural habitat, Lauren has become passionate about ocean clean-up schemes and wildlife protection. Their current collection is comprised of two sub-collections, Skyline and Island Life. 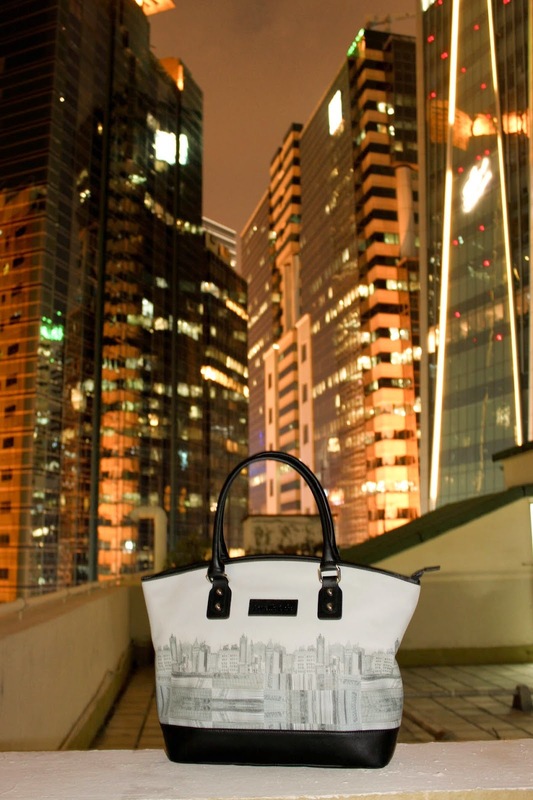 The Skyline collection comprises a handbag, a tote bag, and a silk scarf and a pocket square. Both bags are made of a combination of high quality real and faux leather. They have a zip closure and are lined in pale grey with three internal pockets, one of which is zipped. The handbag has both fixed handles and a detachable shoulder strap. The tote’s two handles are long enough to enable it to be worn on the shoulder. One of the many reasons I love working with small brands is hearing about the origins of a design. This silk scarf grew out of a sketch Karen made when she missed the Lamma ferry home. While waiting for the next one she sat in a bar on top of the International Finance Centre. 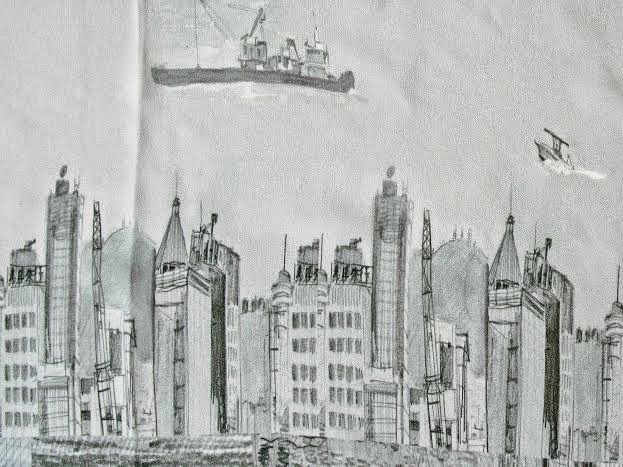 She drew some of the buildings and some of the boats going past in Victoria harbour and this beautiful design was born. Regular readers will know that I have an enduring love of all things nautical. I don’t really know why this is because I live about as far away from the coast as you can get. The typical nautical colours of navy, red and white hold huge appeal too, so the Louella Odie Island Life Collection really floats my boat. The faux leather bag comes in three designs, each a capacious 50cm wide and 40cm high. The handles are long enough to allow it to be carried on the shoulder as well as carried as a tote. They are as versatile and practical as they are beautiful. 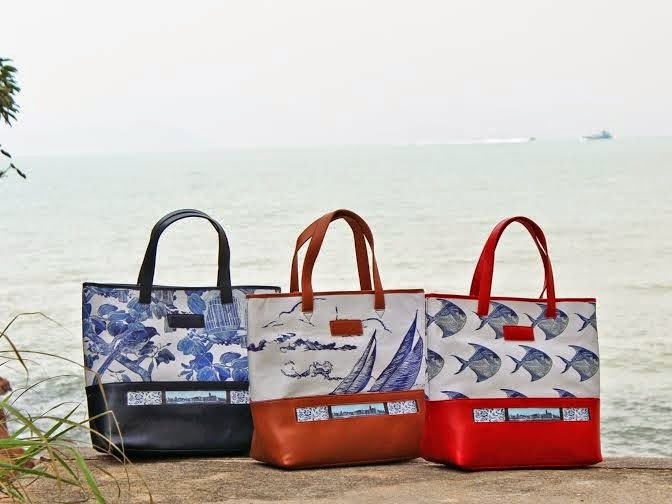 The print on the Bauhinia Bag on the left comes from an original artwork and features the Blue-Tail Chinese magpie with the traditional birdcage and the Hong Kong bauhinia flower. I think this would look perfect with denim and a white shirt. The Pomfnet Bag on the right is my personal favourite. The pomfnet fish is commonly found in the markets and restaurants of Hong Kong. I adore the bright red with the blue. I’m always drawn to the beauty of natural forms- snowflakes, starfish, seahorses, dragonflies. It’s little wonder this appeals so. 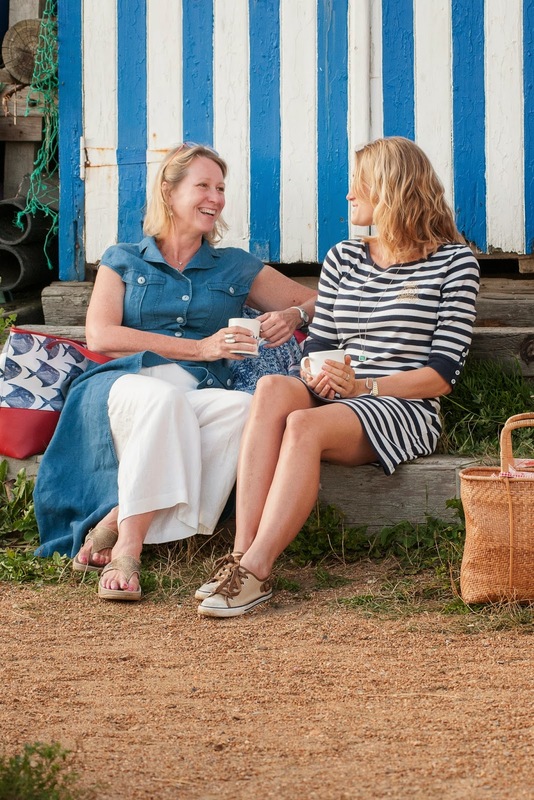 Their home island of The Isle of Wight and the regattas in Cowes inspired Karen and Lauren’s Sailing Boat Bag. The classic combination of blue with tan is just perfect. Also featuring fish is this beautiful Beach Wrap. The design on this generous wrap (130cmx200cm) was based on a selection of Karen’s lino cuts. From beach to bar, it’s the perfect cover-up. As a boy, my youngest brother loved sharks and we used to watch “videos” over and over of shark documentaries. Because of this I have quite an interest in them and their welfare. The design on this silk pocket square was derived from a print over six feet long. 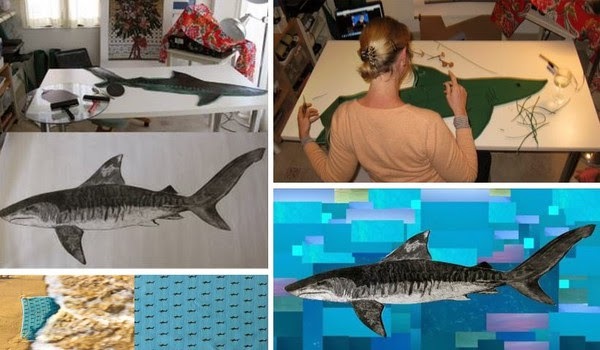 It stemmed from Karen and Lauren’s interest in conservation and their opposition to the shark finning industry in Hong Kong. 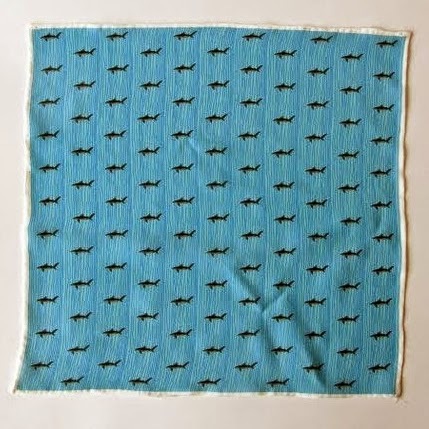 My brother would love this (he has quite a collection of pocket squares), but actually, I’d be very happy to wear it too. Do go and take a look at this beautiful website and let me know what you think. I think everything is exquisite. As I said, my favourite is the Pomfnet Bag. What’s yours? It’s well worth noting that international delivery is free via the standard postal service or charged at $30 for quicker delivery by courier. What a great story and such pretty prints/patterns.